Mother is not just a word, but a whole set of emotions and motherhood is one of the best things to happen to a woman. From carrying a child in their womb for months to having them delivered to taking care of them, it is an overwhelming experience and painful too. But mother as they are, they always overlook the pain that comes and enjoy the bliss of nurturing a cheerful life they gave birth to. It is indeed a one-of-a-kind experience and accomplishment to become a mother and with it, comes a host of responsibilities to cover and achieve. One becomes weak, cranky, needs a lot of attention and pampering. Mamaearth understands this notion and emotion. They have the best of products in the Child Range for newborns and kids for their skin and hair care. I was lucky enough to receive all their baby products for review and I must say, they all were living up to the promise as given by the founders of Mamaearth. This month, I received Mamaearth Epsom Salt for review. Let me discuss how I found it. The product came in a good packaging and Mamaearth is always known for their clean and neat packing. Next, the Epsom Salt I received is of 200gms and priced at INR 399, which is reasonable as compared to other product sellers, as it is of good quality and made after lots of research and development. It is known for reducing body pain and relieving foot ache, cleaning pores, flushing out toxins and detoxifying the skin. It is best for an expecting mother and after post-delivery. Magnesium component helps in relaxing the muscles and lavender essential oil helps in soothing one’s mind. Adding Epsom Salt in one’s bathwater triggers a process called as osmosis which pulls out harmful toxins from our body. One can also use it as a body scrub by mixing it with Shower gel. It is clinically tested in Europe, is hypoallergenic and fragrance-free (natural flower extracts for fragrance) Madesafe certified – Asia’s first Madesafe certified brand, no parabens, sulfates, mineral oil, synthetic fragrances, etc. I would hence rate it 5/5 as it is effective. 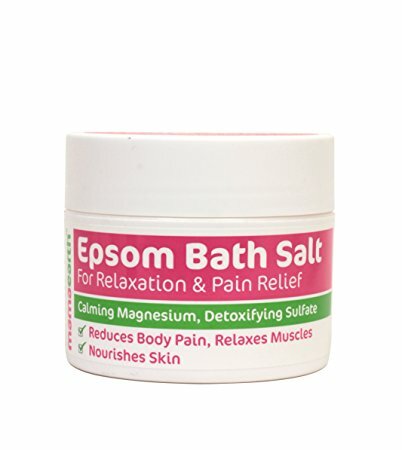 What do you use for relieving body ache? Stop using medicines unnecessarily and switch to Epsom Salt which is a much natural and effective way to rid you of most of your bodily aches. Share your thoughts in the comment section. The Epsom Salt looks amazing. I must say the mamarange is great. Where can l order this? Mamaearth products are really worth buying. Loving your honest review. After reading your review I guess I should try this brand for sure.